We should be cautious and wait a couple of months before we conclude the labour market is definitely on the mend, writes Richard Exell. Today’s labour market statistics (pdf) were positive, the question is: how positive? • In the three months from November to January, there were 29,115,000 people in employment, up 9,000 from the August-October quarter. • Total weekly hours worked rose 5.7 million – continuing a trend that has been positive since April-June. • The number of people unemployed for more than 12 months fell 12,000 to 855,000 and the number unemployed for more than 24 months fell 25,000 to 405,000. 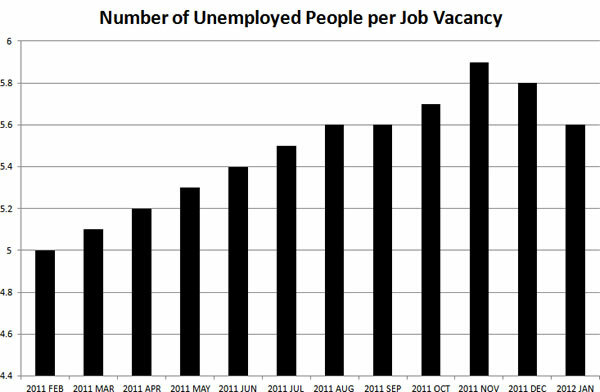 • The number of unemployed people per job vacancy, which rose steadily through most of last year, now seems to be on a definite downward trend, as Chart 1 shows. These figures haven’t come out of the blue. Last month’s headline employment figures were even better (up 60,000) and the Recruitment and Employment Confederation reports increased permanent placements by employment agencies. Markit’s regional Purchasing Managers’ Indexes for February indicated London was the only region where employment dropped. The government will have been particularly pleased the new public sector employment statistics (pdf) showed that in the last quarter of 2011 private sector employment growth of 45,000 was significantly higher than the net loss of 37,000 public sector jobs. There are further signs that the labour market is stabilising despite the tough economic climate, according to new figures published by the Office for National Statistics today. 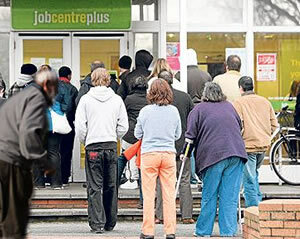 Although unemployment showed a rise of 28,000 compared to the previous quarter, it was 5,000 below the headline figure published last month. Now that is rather over-egging the pudding. The labour market statistics are collected on a rolling quarter basis – this month’s figures are based on data for November, December and January; last month’s on October, November and December. This means that this month’s figures overlap with last month’s and you have to be careful with comparisons like this. Where you’re using both the month-on-month and quarter-on-quarter figures to make a similar point but with more emphasis, or trying to identify a blip or a turning point then the exercise can be useful. But you shouldn’t really use a comparison like this to persuade people to give less weight to the main result – in this case, the 28,000 increase in unemployment. And you really shouldn’t then go on to use data collected on a rolling three month basis in the opposite way because it now suits your purpose. The DWP release highlights “a significant number of jobs available, with 473,000 unfilled vacancies, up 15,000 on the previous quarter” [December-February]. That figure is true, but it’s also true that the November-January figure is 478,000. Either the comparison with the previous month is relevant or it isn’t, the government should have decided which and stuck to it. The truth about today’s statistics is that they are fairly good, but this isn’t the right time to get excited. As Table 1 shows, the increase of 9,000 in employment is a net figure that disguises much larger shifts in full-time and part-time employment. It wouldn’t do to get too het up about the public sector employment figures either. The quarter-on-quarter figures show private sector employment rising more than public sector employment has fallen but if we compare the Q4 figures for 2011 with those for 2010 the public sector estimate is 270,000 lower and the private sector estimate 226,000 higher. Of course, it is possible the Q4 figures represent a trend so it is worth looking at the quarter-on-quarter changes over the past couple of years (see Chart 2). nb. We’ve truncated the scale so we can see what’s changing – private sector employment rose 314,000 in Q2 2010. 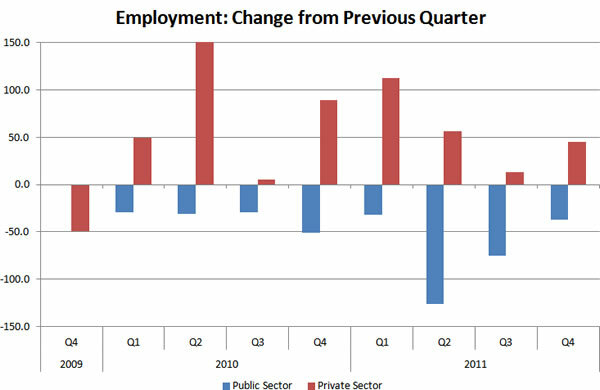 The good overall result in the last quarter of 2011 is at least as much the result of the lower level of public sector job losses as the increase in private sector gains. You need to make a judgement about whether you think that is going to be maintained in 2012 but what we know about forthcoming cuts suggests not. A final reason for caution about these figures is that we were in much the same position this time last year, as Graph 1 shows. 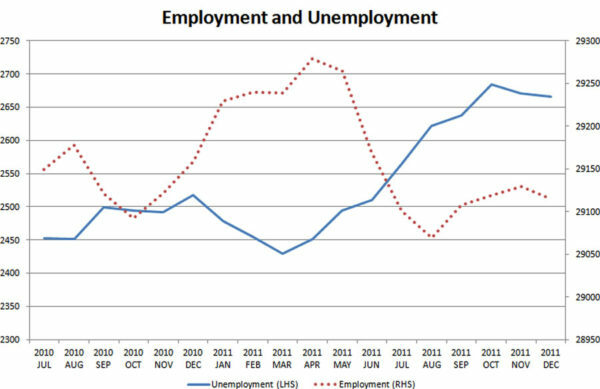 Employment was rising and unemployment was falling, both rather more strongly than at present. That’s no guarantee the same will happen this year, but it should encourage us to be cautious and wait a couple of months before we conclude the labour market is definitely on the mend. How accurate do you think those figures are? To say with certainty that 28000 (even +/- 2000)more people are unemployed than before out of a population of 60000000 would take an ENORMOUS poll. You are treating the figures as if they were exact which they most certainly are not, they have significant uncertainty. Skilled labour is pouring out of the country, people are abandoning their job searches or taking part-time jobs. The number of jobs has spiked downwards. These are not positive signs. Fair point Callum – and, of course, it applies even more strongly to the 9,000 increase in employment. But you’re right, in labour market policy discussions we tend not to pay enough attention to the confidence intervals in the results. In fact, I did think about including a section on this in the original post – apart from anything else, it is another reason for being unwilling yet to say that the labour market is definitely improving. In the end, I cut out what I’d written because the post was getting too long, but I am planning to return to this issue at some future point.